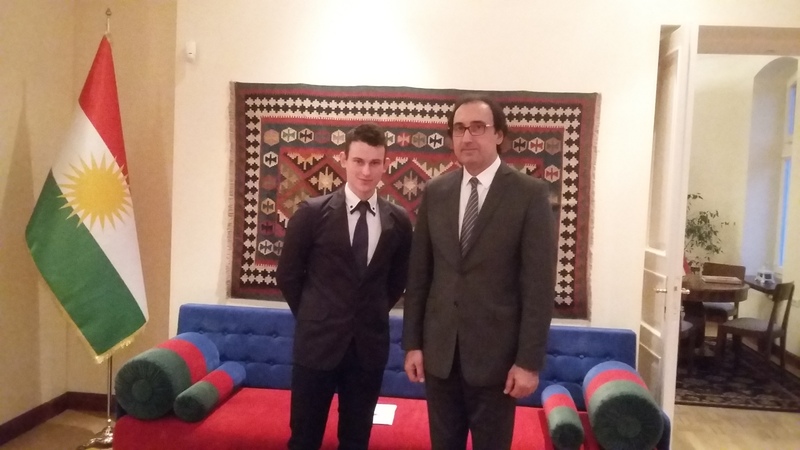 On February 16 in Warsaw, a meeting was held between Kurdistan representative in Poland, Mr. Ziyad Raoof and Polish think-thanks at the New Year’s meeting. Thanks to cooperation with the Foreign Affairs Portal, I was able to participate in this important meeting. The put forward were the Kurds’ situation in the current Middle East crisis, the crime committed by the Saddam Hussein regime on Kurds in the „Al-Anfal Operation”, and Polish parliament’s attitude to this issue, as well as the refugee affairs and the war against the so-called Islamic State. I am sure that we will hear about the Kurdistan Region this year, and loudly. Why? A referendum on Kurdistan’s independence is planned. When will it take place? I invite you to read further. Kurds have practically always been under the rule of the Ottoman Empire, but they enjoyed great freedom in their duchies. Of course, independence revolts were stirred up, but were quickly suppressed. During the fall of the Ottoman Empire, which after the defeat of the Crimean War with the Russian Empire in 1853-1856 began to fall apart. The sultans reigning in order to keep the Empire in check decided to bring terror among ethnic minorities. The Berlin Congress of 1878 confirmed these minorities’ belief that their voice is being heard, in particular by the growing aspirations of the Russian Empire to conquer Constantinople. Resettlements and ethnic cleansing started. Armenians suffered the most. The first wave of massacres occurred in the 1890s. Another one after the Young Turks took power. Initially, after taking power in 1908, they promised to respect the rights of minorities and include them in political life, but radically changed their minds after losing the war against the so-called Balkan League in 1913. Seeing that minorities were a problem in the Empire, the genocide of the largest group – Armenians, was committed. About 2.5 million Armenians died. Kurds were also used to commit this genocide, as the wool was pulled over their eyes, that they would this way gain the desired autonomy. You can read about the collapse of the Ottoman Empire here. After the First World War, the official disintegration of the Ottoman Empire took place. In 1920, the Treaty of Sévères followed. These conditions were unacceptable for the Turks. The artificial state of Iraq was established under the French mandate and former Persia and Syria under the British mandate. In these treaties, the Kingdom of Kurdistan was guaranteed. After the revision of these provisions, the Treaty of Lausanne was signed (together with Turkey) in 1923. With these treaties, the Kingdom was divided between four countries – Turkey, Syria, Iraq and Iran. In 1924, after the British discovery of oil in Kurdistan, they liquidated the Kingdom, incorporating it under their Iraqi mandate. The policy pursued by Kemal Atatürk, perfect for the Turks, was an oppression for the Kurds. They were deprived of all rights, communicating in Kurdish was forbidden, mentionin Kurds were sanctioned, they were simply treated as „inferior” people.They were similarly perceived in Syria, Iran and Iraq. Living under oppression, in fear, the Kurds had a chance to gain rights in a state that was politically unstable. Turkey was developing dynamically. She joined NATO and the UN, was building its economy in accordance with the ideology of kemalism: „peace in the country, peace in the world”. In Iran, the pro-American check of Pahlavia was ruling (in fact, a Middle Eastern US puppet). Here I am writing about Pahlavi’s taking power and reign. In Syria, since 1963, the Baath party was ruling with a rod of iron, spreading its ideology to neighboring countries. It arrived in Iraq in 1968, where a coup took place. Kurds, feeling discriminated in every state, decided to take up arms in the last country that could gain autonomy. The two-year struggle led to Iraq’s commitment to create an autonomous Kurdistan Region, allowing the Kurds to be part of the central government, giving the possibility of using and Kurdish and teachin in it, as well as holding administrative offices in the newly-created Region. However, there have been inconsistencies in the reasoning of the Kurdistan Region. Iraq wanted to create a region without Kirkuk, a center of Kurdish culture. Why? Kirkuk is an area exceptionally rich in oil. This was the main reason for not accepting the agreement. In 1972, Iraq again attacked the Kurds to subordinate them. This time they got help from Iran. In 1978, Saddam Hussein seized power in Iraq, attacking Iran being in crisis in 1980. In 1979, Pahawiyah’s check was overthrown by a revolution led by Ruhollah Chomejni. The United States feared the developing situation in the Middle East and how Iran would deal with the Soviet Union. At the suggestion and with support of the US, Hussein attacked Iran. Initially, the Iraqi army was successful. 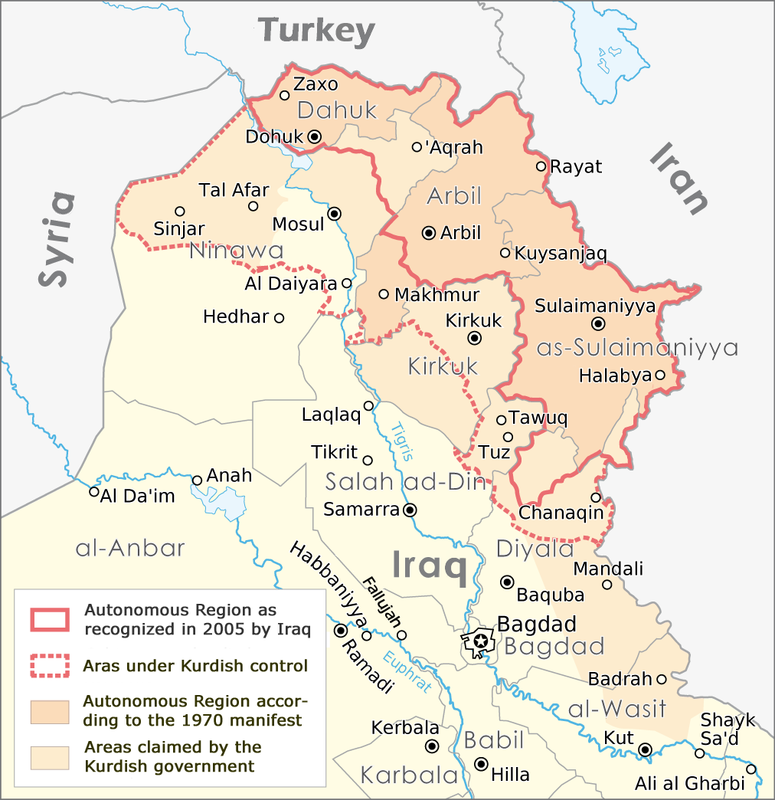 In 1983, unable to wage war on two fronts, it signed an agreement with the Kurds on the aforementioned creation of the Kurdistan Region, including the Kirkuk area. The Iraqi leader, however, failed to fullfil the obliation imposed by the agreement. In 1985, the Iranian-Kurdish counterattack took place. Iraq clearly stepped back. Ronald Reagan’s policy consisted in preventing Iran from being a state that counted in the region. The President wanted to keep American influence in this region at all costs. According to the declassified CIA documents, the United States supported Iraq’s warfare by providing intelligence (analysis of satellite images, troops’ movements, etc. ), as well as weapons, including chemical weapons. In 1987, an agreement was reached between Kurds and Iran, announcing the struggle for independence of Kurdistan. However, since 1987, the warfare remained dormant for a year and in August 1988 a final agreement was reached terminating the conflict. On February 23, 1988, Hussein started an extensive action to eliminate the „weaker” enemy and its supporting army – the Kurds. In addition to conventional weapons, officially only on 16 March chemical weapons were used in Halabda. Then, there were another 13 in other villages and cities. The scenario was always the same. Initially, a nair raid was carried out with conventional weapons, then with napalm and the last strike was with chemical weapons. These military actions were subject to the „Al-Anfal” operation. The name comes from the eighth Surah of the Koran, referring to the fight against infidels. Until August, when a truce with Iran tokk place, the Hussein regime destroyed over 4,000 villages and killed over 180,000 people living in Kurdistan’s regions. The last phase of this „operation” was the resettlement that took place after the truce. A significant part of the Kurds fled into the Turkish mountains – over 60,000 people. It is said that „Kurds have only one friend – mountains.” Over 100,000 people fled to Iran. They stayed in refugee facilities. In September 1988, Hussein announced an amnesty for the Kurds, but he forbade them to return to the previously inhabited areas. The Arabs superseded them. That is how the process of arabisation of Iraq ended. The Kurdistan representation in Poland is aiming at the Polish government to deem these acts genocide, as the United Kingdom or Sweden have already done. Soon, discussions with the Polish government concerning this issue will begin. After a grueling war with Iran, Iraq was a terribly indebted country. Its debt, according to the Paris Club, amounted to nearly 120 billion dollars. The biggest creditor was Kuwait. This country has granted a loan for over 10 billion dollars. Hussein appealed to Kuwait for cancelin its debt. The argument was to stop Iran from expanding the Arab revolution to the entire Arab world. He wanted to defend the Middle East and Africa from events similar to the Arab Spring of 2011. Oil extraction potential of the ruined country also fell significantly, in response to which Iraq demanded from the OPEC cartel, that it reduced the amount of oil extraction, in order to reduce its supply in the market, which would cause an increase of prices. Both OPEC and Kuwait did not bow to Iraq’s wishes. In this case, Hussein had nothing else left to do but to attack the largest creditor, arguing that Kuwait was dumping oil prices in Iraq and that it had annexed the disputed territory of ​​the former Ottoman province of Al-Brasa. In 1990, an attack on Kuwait started. The UN Security Council immediately reacted by introducing a trade blockade of Iraq and creating a military coalition. This led to the withdrawal of Iraqi troops. Inside Iraq, Shia and Kurdish uprisings were brutally suppressed. A response to the suppressed uprisings was the threat of entering of coalition troops into Iraq. Hussein had to hold discussions with both groups. In 1991 The Kurds obtained an assurance about the establishment of the Kurdistan Region from 1985, which in fact it happened in 1992 after proclaiming the independence of the region, although remaining within the Iraqi state. To guarantee Kurds’ and Shiites’ safety, UNSC prohibited flights north of 32 ° N and south of 36 ° N.
After the events of September 11, 2001, the United States declared war against terrorism. This was the main argument to militarily enter Iraq together with the coalition forces. The second motif was the possession of weapons of mass destruction by Iraq. In fact, Iraq possessed weapons of mass destruction, but not in a nuclear form, but in the form of chemical weapons previously bought from … the United States! In 2003, coalition troops entered the Iraqi territory. Turkey refused to give access to its territory to form the northern front, and refused to participate in operations. The Kurds lend a helping hand, enabling everything Turkey refused. They actively participated in military actions, cooperating with American troops. Kurds counted on the help of the United States in the negotiations after the end of the war, in the form of creation of its own state. However, the Americans decided not to interfere in state affairs that much. In 2004, at the initiative of the United States, a temporary Iraqi Governing Council was formed, which based the vision of the future system on the idea proposed by the Kurds – a federal state. On January 30, 2005, an unofficial referendum concerning the issue of autonomy was held in the Kurdistan Region. 98% of the people living in this territory were in favor of autonomy. The authorities of the Kurdistan Region have decided to remain part of Iraq as part of the federal government, which, thanks to this referendum, had solid arguments before the election. In the parliament, the „Kurdistan Alliance” gained as much as 26% of the entire Iraqi society’s support, giving it 75 mandates out of 275 possible, becoming thereby the second largest force in the parliament. The Kurds significantly contributed to the creation of the Iraqi constitution of 2005. Iraq has become a federal state, and the constitution assured that the Kurdistan Region is a federal region that can run its own economic policy, with its own parliament and Kurdish as administrative language, as well as its own president – Masuda Barzani. It is this President that is responsible, together with his father, for the political and economic successes of Kurdistan. All these privileges, however, fall within the central government in Baghdad. The Kurdistan Region was also provided for with 17% of profits from oil trade from the central government, as well as financing of the army in Kurdistan. The President of Iraq for two tenures was a Kurd – Jalal Talabani. This was a confirmation of the growing importance of the Kurds in political life and the formation of the political system in Iraq. It is typical for federations that it is not the president who runs the country, but the chancellor or the prime minister. The prime minister was Nuri al-Maliki. From the beginning of his governance he did not comply with the constitution, which explicitly mentioned respecting the rights of minorities and protecting them in the country, and also guaranteed that the power was to be divided among Arabs, Kurds, Shiites, Sunnis and Yazidis. Instead, the Prime Minister once again gathered Power in his hands, primarily the service and to a large extent also the Central Bank. He neglected financing of the Kurdish services of 200,000 soldiers and 100,000 police officers, as well as the entire administrative system. Coming down with the aforementioned 17% of profits from oil trading were also stopped. Corruption in government was widespread. Iraq was falling apart again. As a reaction to these events, the Kurdistan Region decided to take care of itself. It built a gas pipeline and oil pipeline with Turkey. It signed a multiannual and multibillion agreement with the Turkish government concerning export of these two raw materials. It based its development on them, as being one of the most rich regions in oil supply in the world. The percentage of income to the budget from oil alone is around 80. Free trade is developing dynamically. They have no choice, as serious regulations would deter investors such as ExxonMobil, Chevron, Total, Gazprom and 21 other industrial barons from the aforementioned industries. During the recent five years representatives of the Turkish government have spoken warmly about the creation of IRAQ KURDISTAN as an independent state. We can see that since 1992 both economic and political dynamic development modeled on western patterns has contributed to the increase of Kurdistan’s credibility as a partner. This opinion had been shared in February 2015 by Swedish Minister of Foreign Affairs Margot Wallström, her British counterpart William Hague, and also Victor Orbán. In terms of religion it is a very tolerant and open region, at the same time enforcing its residents to treat each other with dignity. The policy of Prime Minister Nuri al-Maliki has led to the fact that the so-called Islamic “State” took over most of the country’s territory in just 24 hours. Iraqi army did not exist. The international community agrees that the Peshmerga are the most effective land army in the Middle East to fight terrorists. More than 1,300 Peshmergas died in defense of their autonomous region and about 1,000 were injured. ISIS destroys everything on its way. These are not persons willing to negotiate. An example can be the razed city of Shingal, as well as the fact that in the first months ISIS committed genocide on Yazidis. They murdered 35,000 Yazidis and buried them in mass graves. About 5 million people live in Iraqi Kurdistan. During the migration of refugees, 1.8 million people arrived in such a small region. For comparison, almost 75 million Turkey accommodated about 5 million. For Kurdistan, this means an increase of population by 36%! As to the economic development of Kurdistan, it opted for the best relations with its neighbours, as only good relations will lead to a flowering of Kurdistan, and it will also be a mutual benefit. As of today, 25 billion USD have already been invested in Kurdistan. Last minutes to were devoted to an exchange. I raised the following issues. As we know Islamic State is financed by the coalition forces fighting them and not imposing sanctions on these countries by the UN, I wanted to get to know the vision of solving the crisis in the Middle East presented by Mr. Raoof. The response I got was logical and simple. Cutting off all commercial and barter trade (weapons) with Islamic State. We cannot be short-sighted. The conflict is absorbing more and more victims and it is a humanitarian tragedy. That was Mr. Raoof’s response. Another interesting issue for me was the shape of the economy of independent Kurdistan. If sanctions on oil trading are imposed, Kurdistan will be bankrupt. I wanted to get a closer look at this matter. Mr. Ziyad Raoof, answering to me clearly indicated, that Kurdistan wants to have very good relations with its neighbours as it will lead to an increase in trade, as well as credibility and trust in business. In the Kurdistan Region there are no customs duties as well and it is focused on foreign investments. Legal and political conditions of Kurdistan are conducive to this. In conclusion, international society is becoming more and more convinced of the position of Kurdistan as a reliable partner. It is the only region where a stable democracy is being developed, which lasts from 1992 without any disturbance. The last and most important thing that I learned was the issue of a referendum on the independence of Kurdistan. It will take place in Iraqi Kurdistan and in areas inhabited by Kurds, as well as in those areas, where the Peshmerga were victorious. The planned date of the referendum is a few months before the presidential election in the United States. Once again I would like to thank Mr Ziyadow Raoof for the meeting and relaying knowledge and insights, so that I could inform you about the situation of the Kurds. Thanks should also be extended to the portal for Foreign Affairs for giving me the opportunity to participate in this meeting as one of the few portals in Poland.